Prince Harry and Meghan Markle despite the harsh snowy conditions at the south west of England, continued with their official visit to Bristol on February 1, 2019. The weather conditions were the reason of a slight delay in their arrival. The Duke and Duchess went ahead with their day-long visit after Kensington Palace confirmed a go-ahead of their visit despite the weather. The waiting crowds had reduced due to the icy temperatures. There was a concern that the harsh weather conditions would hamper their journey down from London and is also understood that contingency plans were being put in place in case of any trouble. Reports said that the couple was determined to be there. The two cancelled their plan to fly because of the weather and arrived by train about half an hour later than they had planned. 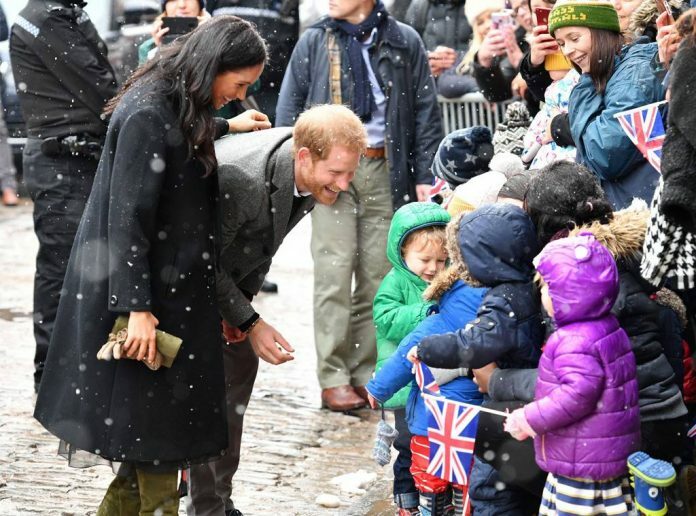 The 37 year old , who is expecting her first child with Prince Harry, looked elegant for their joint engagement while greeting loyal fans and a bunch if excited youngsters from Abbeywood pre-school. The children had spent a chilly morning while waiting for the royals. Meghan was seen wearing dark outfit for the visit and was seen in a Willam Vintage wooly coat and a printed Oscar de la Renta outfit worth £1,400. The former Bollywood actress introduced color to her ensemble with a Sarah Flint Marina suede olive knee high boots. Meghan left her blow-dried hair down with soft curls for the occasion. During their visit, the royals met the members of the public to learn more about the rich cultural history of the city and visited organizations supporting communities that were most in need. The couple started off their visit to the Bristol Old Vic, the oldest working theatre in the English Speaking world that was built in 1766. The Duchess surely has a soft corner with theatre as she has spent a decade working as an actress on TV.